Here’s a trick question. Which pop-culture text gave currency to this statement: “When you want something, all the universe conspires in helping you to achieve it"? From a dialogue in a Shah Rukh Khan movie to Albus Dumbledore in Harry Potter, it feels as though it could come from anywhere, doesn’t it? But, as it happens, the line first appears in The Alchemist, best-selling Brazilian writer Paulo Coelho’s novel, published 30 years ago. Not once, not twice, but over and over again. The remark surfaces every few pages, almost like a refrain, hammering its message into the reader’s head. In case you find it trite, if not fanciful, here’s a sobering fact: The Alchemist has, till now, sold close to two million copies in India and keeps selling around 140,000 copies year on year. “This is also one of the most pirated books in the country, so you can imagine the real consumption would have been even higher," adds Rahul Dixit, director of sales at HarperCollins Publishers India, which distributes the book in the country. According to a report published by Amazon.in, the book featured at No.10 among last year’s most selling titles on the website. Looking for a copy in the used books section of the Blossom Book House in Bengaluru, I was offered a choice of at least four editions, with different images on the cover. I picked the one with the face of a boy floating in an orange glow, with Egyptian pyramids in the background. Not only did it cost the least but it also had an endorsement by—wait for it—Madonna: “a beautiful book about magic, dreams and the treasures we seek elsewhere and then find at our doorstep". That praise just about summarizes the arc of the plot of The Alchemist and also perhaps explains its enduring appeal. Few novels have preyed on the conflicted psyche of the 21st century reader as slyly. Structured around a typical story of quest—for none other than the elusive elixir of life—the novel wavers between the planes of earthly desire (in its search for love and wealth) and spirituality (in its portrayal of the longing for God and higher wisdom). Santiago, the hero who sets out from Spain on a journey through the deserts of Africa to Egypt, is led by the eponymous alchemist, allegedly 200 years old, to discover the most wondrous treasure known to man. The adventures they get into—from theft in a market in Tangiers to wars with “infidels" in the Sahara desert to attacks by deadly snakes—bring to mind the Indiana Jones movies— but with dollops of self-help pep talk thrown in for good measure. It’s a formula many have attempted since, though none have found Coelho’s golden touch. 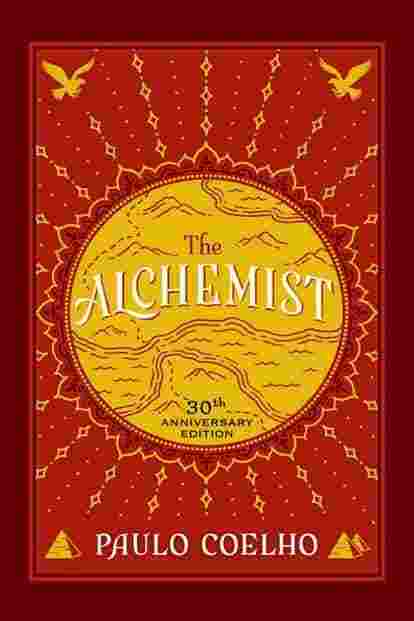 The 30th anniversary edition of The Alchemist.